Today I started with debuting all the edges and large holes of the two mid fuselage side skins. Not too much to show with that process so there are no photos of it. When I finished that work up I ran to Home Depot to grab a 4′ section of 3/4″ x 3/4″ aluminum angle for the bending of those skins. The plans give you several measurements that you use to make some lines for reference as you bend. The first is a line 1/4″ below the rivet line that lies at an angle. The other is a line that is 5/8″ up from the bottom of the skin. The plans then tell you to bevel the two edges of a 2″x4″x24″ board at 45° angles. I then cut two 24″ pieces out of the angle I just bought. I then clamped the skin between the workbench and the beveled 2″x4″ board on the line I drew below the rivet line. With the skin in place I clamped one of the 3/4″ angles to the underside of the skin lined up with the 5/8″ line I drew. I matched drilled to two outside holes of the skin to the angle so they matched. I removed the angle from the skin and clamped it to the other angle and match drilled the two holes so that the two angles now match the skin. I also had to cut the web on one end of the top angle so that as the skin/angles are rolled that it wouldn’t interfere with the wood. I replaced the two angles to the skin, checked them and added 3 clamps to hold it all together. I then grabbed my large vise-grips and placed them at the aft end of the angles. I used the vise-grips to rotate the skin slowly. I made this process in several steps rechecking the bend. The goal is to have a conical shape starting with an 1/8″ forward to a larger come aft. The plans say it’s better to under do the bend than over do it. I stopped short of 90° and was very pleased with how it looked. I removed all the parts and repeated the whole process on the other skin making sure that I did the bend in the proper direction so I ended up with a left and right skin. Before I could put these skins on the seat structure I needed to drill a 2 5/8″ hole in the right outboard seat rib and the right side skin. This will allow a tube for fresh air to run from the NACA vent in the right wing thru to the eyeball vent for the passenger. Van’s punched a hole in both pieces so all I had to do was break out the fly cutter and make the cuts. With that done I checko’ed the forward and aft outboard ribs in place as well at the edge floor support that runs along the top of those ribs. Now that they were in place I could add the side skins. I was very pleased at how the bend looked when installed. I then added all the substructure to the side walls including the arm rests, side bulkheads, aft bulkhead, floor side support and gussets. Another fun day in the Hangar and things really taking shape. 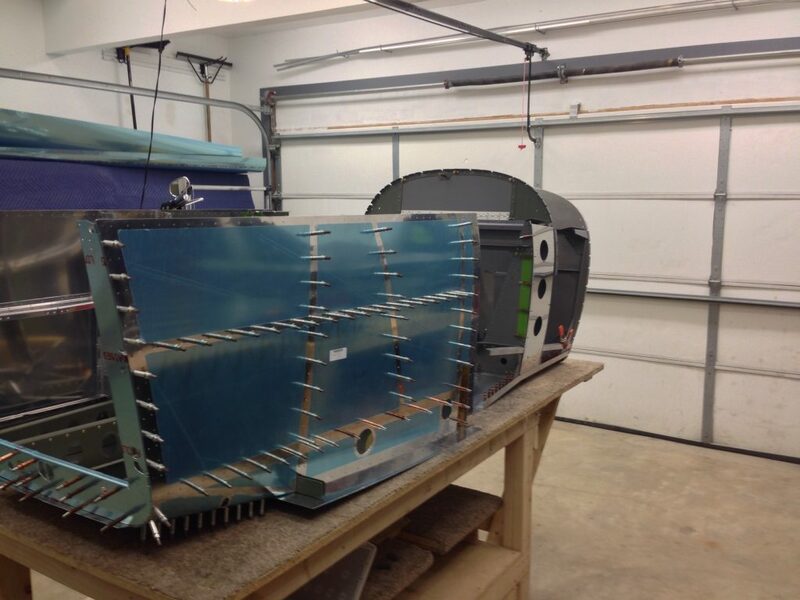 Here is a view of the hole fuselage with some skins on. I have to fly the next couple days and have training next week so the build will be on hold for a week and a half but I will hit it hard when I’m back.